This article outlines how to set up a team (made up of A2X users) and then how to go on and link this team to your client's accounts. The teams functionality has been designed for Accounting and Bookkeeping firms who have five or more A2X subscriptions and 5 or more users. Saves time having to individually invite X many users to a single A2X subscription. Users who are part of a team only need to accept the team invite once, independent of how many times this team is added to an A2X subscription. The existing user functionality is NOT impacted by teams unless the user decides to participate in teams. Both individual user and team user functionality can be used at one time on any A2X subscription. A user can be in more than one team. To set up a team navigate to the teams drop down in the top right hand corner. The person who creates a team is the captain of that team and always will be the team captain. The only person who can disband the team is the captain and they can only disband it when they are the only member of the team. Once you have created the team, type in the email address and select ‘Invite’. The invited user will only need to accept an invite when they are initially added to a team (if added to more than one team they will subsequently need to accept this invite as well). When this team is added to any A2X account the team member WILL NOT receive an invite to the account as they have accepted the invite when they were added to the Team. This prevents a user having to accept multiple A2X invites. Only the team captain and the team admin can remove other users from a team. Please note that a team admin and a team member can remove themselves from a team. A team captain can never be removed from their team. Navigate to the ‘Teams’ dropdown. You will be taken to the teams summary page which outlines all the teams your user email address is a part of. Find the team and the user you wish to remove and select ‘unlink user’. This user will now be removed from the team and subsequently all A2X accounts that the user was linked to via the team (unless another team of which they are a member also gives them access to that account). There is a special case where the removed user is also the “account admin” for that account; in this scenario, the user is removed from the team but they retain access to the account. Their access appears on the “users” tab as if they had accepted an individual invite to access the account. To add a team to an account you must be the account admin. This can be done from the teams drop down summary page or by navigating to the account. Select Settings->Users and select the Team that you wish to add. Only the teams that the account admin user is a part of will be offered for selection from the drop down. A user can only link an account to a team when they are admin for the account and a member of that team. Team account access "overrides" any individual account access. 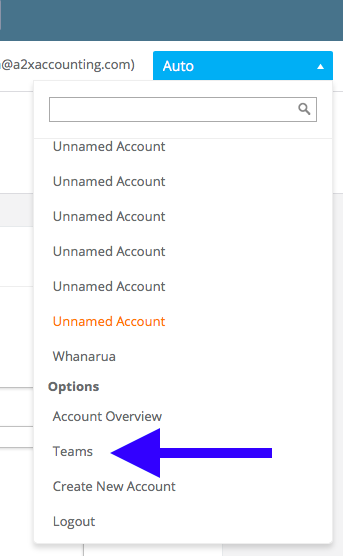 If a user already has individual access to account ‘Client 1’ and then they are added to a team which is subsequently given access to ‘Client 1’, then the "user settings tab" will only show the team - not the user's individual email. If you unlink the team from ‘Client 1’ then that user will completely lose access to ‘Client 1’ UNLESS that user is the account admin. So a user can never - through the teams functionality - have their access removed from an account for which they are account admin. Want to add a team to an account that you are NOT the admin off. Refer to Article 'How To add a Team when not the Admin'.